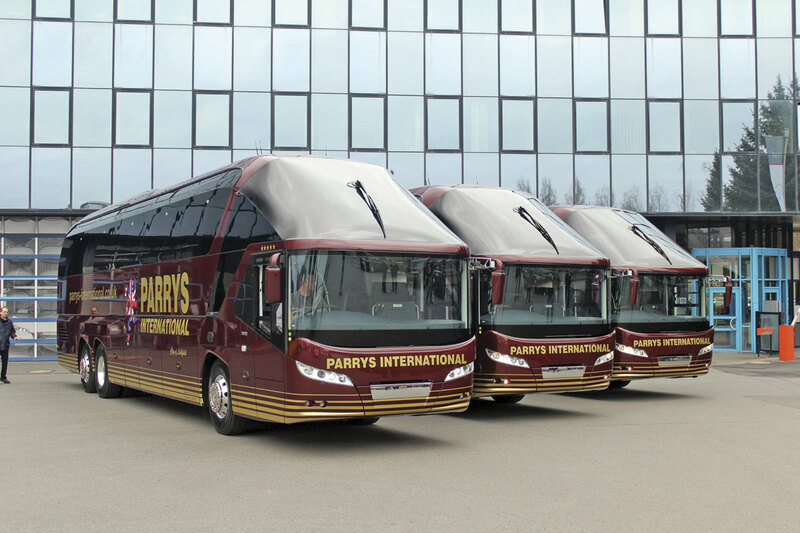 Trio- Parry’s International took delivery of the last Starliner in the UK. 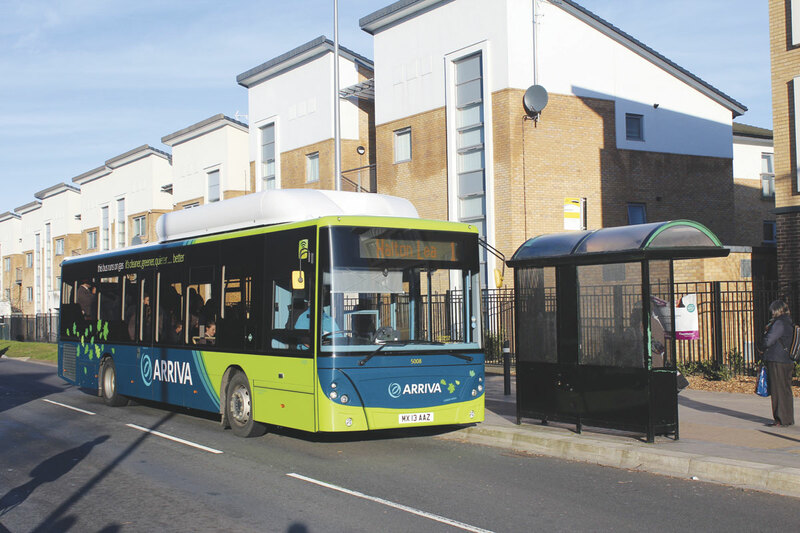 Following a renewed interest in gas vehicles, Arriva were the first to operate the MAN EcoCity gas bus. 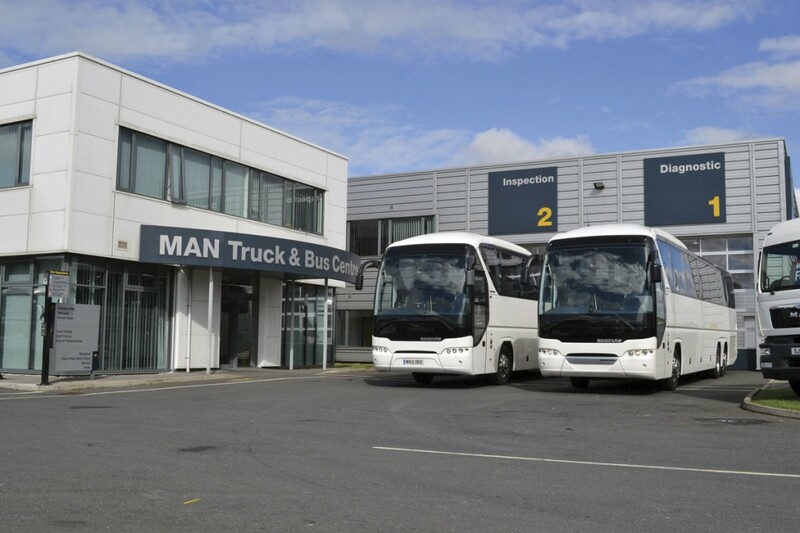 MAN Truck and Bus UK, as it is now formally known, has been through a restructuring process over the last year, in terms of its management and streamlining of the bus and coach side of the business. A number of key new posts include the appointment of UK Sales Director Ian Mitchell, formerly Commercial Truck Director at Volvo; CEO Simon Elliott, who replaced Des Evans in September 2014 and Paul Gardner as General Manager, a promotion from his previous position of National Key Account Manager and filling the gap left by Ian McLean, former Head of UK Bus and Coach, who has moved to the truck division as Head of International Key Accounts and Special Products. I was given the opportunity to meet Paul and his team at the company’s flagship site in Manchester to find out how he has moved the company forward and the products and services they have to offer the industry. 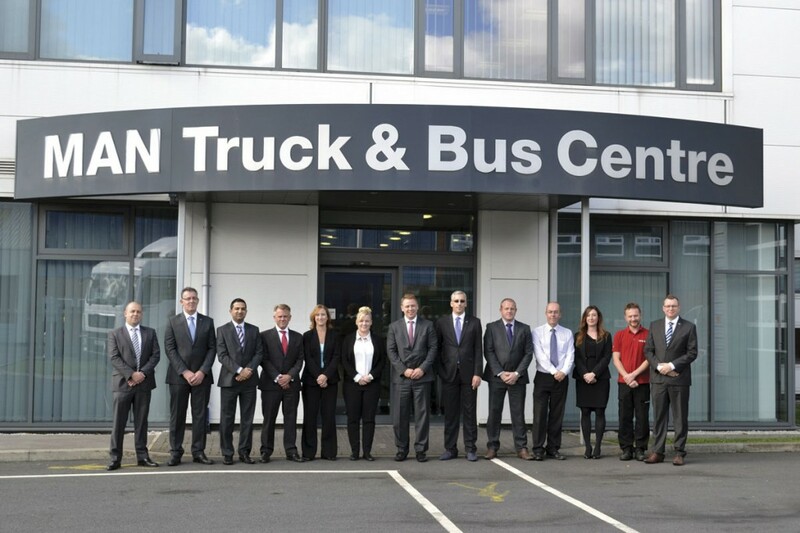 MAN Truck and Bus UK Centre at Manchester is situated on an eight acre site at Trafford Park. It is one of three UK ‘Super Centres’ and was built in 2009. Based on a German model, it boasts a specialist fitment centre. Services available include: vehicle preparation, chassis modification, accident repair and specialist exhaust systems. Although predominantly aimed at trucks, some bus and coach modifications are also carried out on site and the centre can be used for specialist outside work, for example a signwriter could use the facilities so that there would be no delay in handing over the completed vehicle. 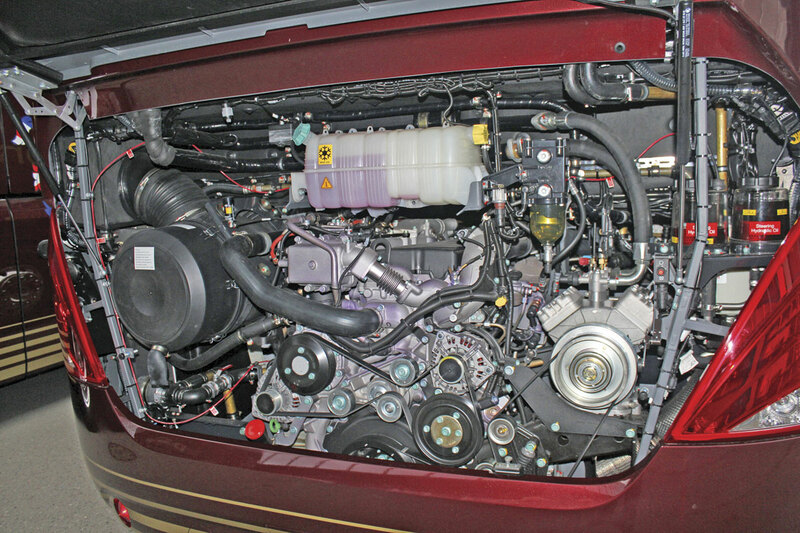 The centre has a diagnostic bay and an inspection bay as well as a VOSA ATF lane. This is open five days a week to the general public and has proved to be a popular facility since the local one closed. The MAN Bus and coach team (LtoR): Matt Neal, TopUsed Retail Manager; Pat Hogan, Regional Aftersales Manager (North); Ajaz Khan, Deputy Head of Fleet Management (Telematics); Steve Lilley, Regional Aftersales Manager (South); Niki Woods, Sales Support Administrator; Shannen Fenton, Sales Support Administrator; Matt Jacob, Senior Retail Sales Executive; Ben Schwarz, Business Development Manager (MAN Aftersales); Graham Wilkinson, Chassis Sales and Support Engineer; Nick Dunn, Business Development Manager (MAN Finance); Lisa Coates, Sales Support Supervisor; Mike Atkinson, TopUsed Operations; Paul J Gardner, General Manager. There is also an isolation petroleum bay and a large workshop. Due to the amount of pits already available on site, there is just one within the workshop and column lifts are also used for vehicle inspection when needed. The diagnostic bay is often used pre-MOT to highlight any potential reasons for failure, giving engineers the opportunity to rectify any problems in order for the customer to maintain a high pass rate. As Paul explained, a lot of vehicle faults or queries these days are electronic and a specialist e-workshop electrical inspection programme has been devised by MAN which aims to meet operator’s legal requirements for documentation, inspection and servicing of their fleet, in line with VOSA Road Worthiness Compliance directives. It also provides greater visibility of driver and vehicle performance to allow improved driver professionalism, fuel economy and road safety, whilst reducing the impact large fleets of vehicles have on the environment. 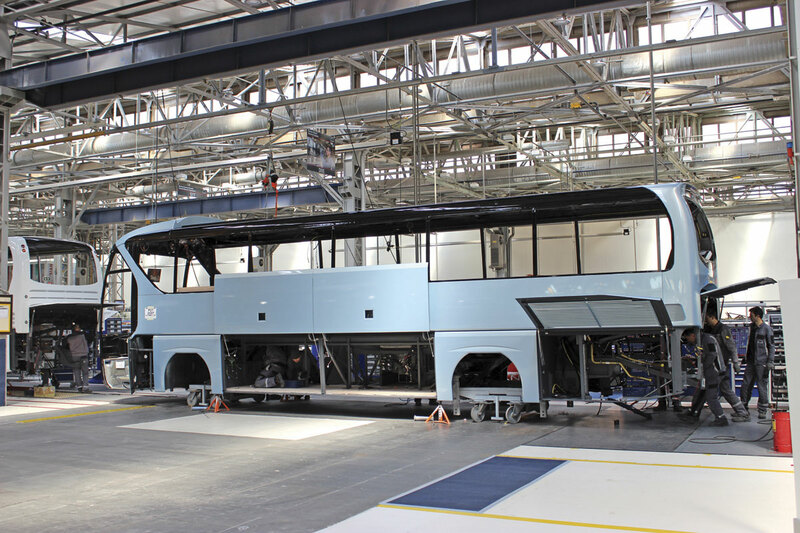 New coaches will enter the inspection bay prior to delivery to ensure that nothing has been overlooked and no damage has occurred during transportation. It is a combined truck and bus centre but only 3% of business is generated through bus and coach. There are currently 33 technicians among the 85 people based at the Manchester Centre. Since Paul Gardner’s appointment as General Manager in February, he has refurbished the ‘customer suite’ on-site and named it the Bus Forum, after a similar facility in Munich, albeit on a much smaller scale. This is a designated area where customers can view prospective purchases and sit in a quiet, comfortable environment with the sales team. It offers a kitchen and lounge area, along with samples from their range of moquettes, leathers and e leathers as well as a selection of bus and coach seats to try out. The vehicle viewing area which forms part of the suite is used as a pre-inspection area for trucks ordinarily and so would be cleared specifically to accommodate coaches. For this reason appointments are preferable. 2014 was a bad year in terms of sales. Bus sales were down 47% with just 69 units sold last year, compared to 129 units in 2013. 150 unit sales are predicted this year and sales are expected to be at a record level, when taking chassis sales in to the equation. Paul attributes much of what the industry may consider to be poor performance figures to the fact that the business model has changed and that the chassis units that they sell aren’t taken into consideration for certain statistics. He referred to the monthly registration figures that the SMMT produce and said this doesn’t fairly show the number of vehicles sold. The TGL chassis frequently appears in truck rather than bus registrations. MAN provide chassis for Nu-Track, BASE, the Moseley Group and Caetano UK and part of MAN’s strategy is to increase their body chassis portfolio and support their partners. The Nu-Track Pulse, which is a collaboration between Wrightbus owned Nu-Track and MAN has just sold its 100th vehicle in just over a year and is built on a MAN TGL 10 tonne truck chassis. Initially built for the Northern Ireland market, it has proven popular within the London boroughs and it is not unheard of for a customer to order ten at a time. The 10 tonne TGL chassis has a MAN DO834 Euro6 EGR/SCR 180bhp engine with 6 speed ZF AS lite Automated Manual gearbox and has been M3 homologated for use for bus and coach applications. It offers a 150 litre fuel tank and 10 litre AdBlue tank. Standard wheelbase is 4.8 to 5.2m although other options are available and it has rear air suspension. 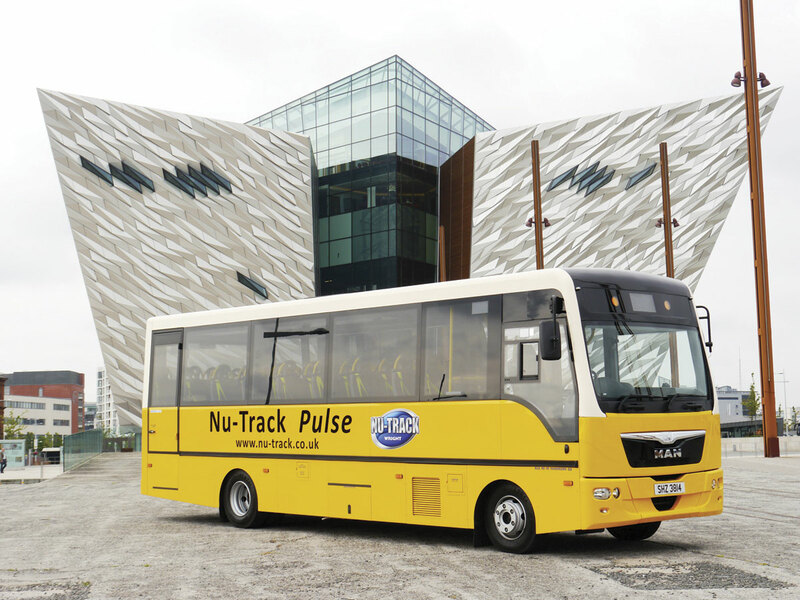 As well as being used on the Nu-Track Pulse, it can be found on the MOBIpeople Midi Explorer, a midi coach from BASE and is seen as a replacement for the now obsolete Mercedes Vario chassis. 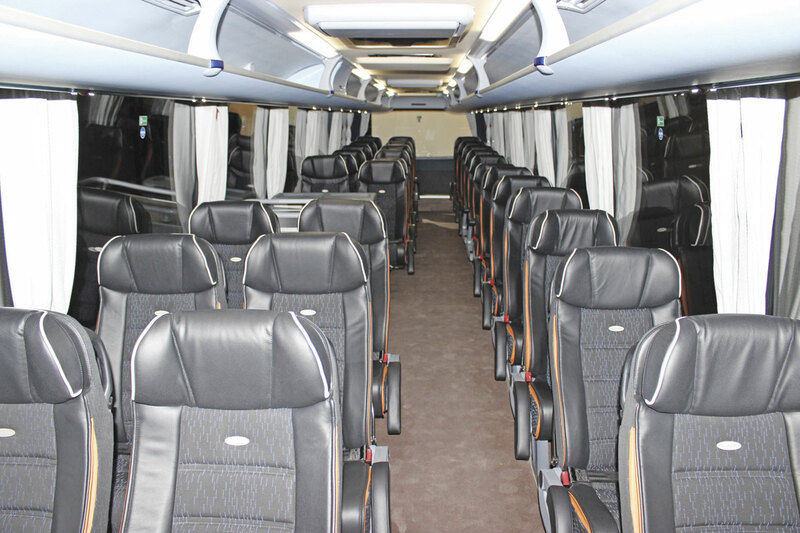 The 8.6m Pulse offers 33 seats with an optional ten wheelchair accessible layout. 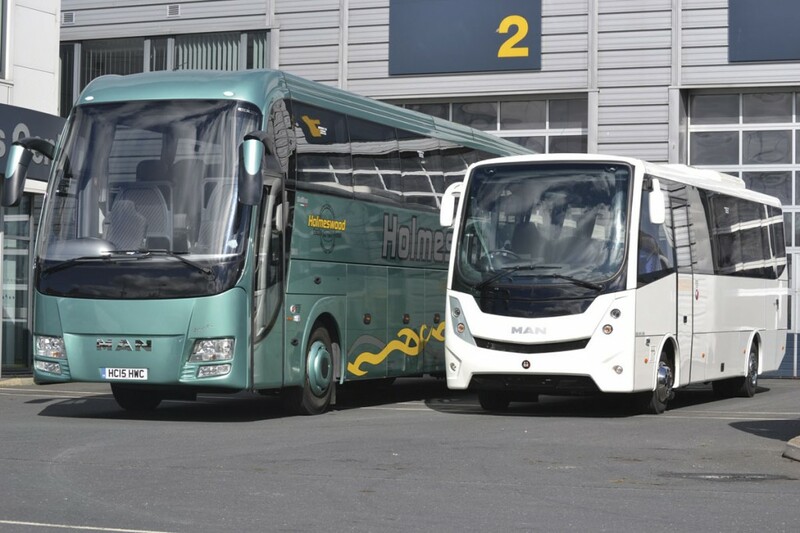 The 9.1m coach bodied MOBIpeople Midi Explorer has a ZF 6AS800.OD MAN TipMatic automated gearbox and offers 29-33 seats (although 39-41 seats can be obtained on the 12 tonne TGL chassis and wheelchair options are available). Both vehicles have Euro6, 180bhp engines. A range of engine sizes, gearboxes and safety and electrical systems are available as options on both the 10 and 12 tonne models. Paul confirmed that TGL sales for bus or coach conversion would peak at 65 for 2015. Three MAN chassis are offered to partners, from the RR coach chassis range; the RR2, the tri-axle RR4 and the RR8. The RR2 is a two axle, 18 tonne chassis available in 10.8m and 12m options for seating capacities in the 33-55 range. It offers a MAN D20, 360bhp Euro6 EGR/SCR engine, with ZF 6AP2000 EcoLife automatic gearbox with integrated retarder. Features include ABS, ESP, lane sensor, brake assist and cruise control. This chassis is used for the Barbi Galileo HD 10.35m 43 seater and the Galileo HDL 12.2m 53-seat coach, both of which have a ZF AS-Tronic gearbox and are supplied by BASE. The Beulas Spica C and Cygnus offered by the Moseley Group use this chassis. The RR4 is a tri-axle 26 tonne coach chassis fitted with a MAN D26, 480bhp Euro6 EGR/SCR engine. It has a 12-speed Tip-Matic automated gearbox and five stage retarder. With many of the same features as the RR2, it also has as standard an immobiliser and reversing alarm. This chassis is used for the Barbi Galileo HDH 13.8m 63-seat coach and the Beulas Glory, Jewel, Mythos and Aura. Finally, the RR8 is a twin axle, 18 tonne intercity coach chassis. Fitted with a MAN D08 290-360 BHP Euro6 engine, with ZF 6 AP 2000 EcoLife automatic gearbox with integrated retarder. This chassis is used on the 290bhp Beulas Spica C and the MOBIpeople Explorer II 12.5m from BASE, available in 57 or 70 seat options. Optional extras on all these chassis include; adaptive cruise control, lane guard, bus stop brake, tyre pressure monitoring, idle shut down and a third alternator. In 2010 MAN were selling small quantities of coach chassis each year, however Paul confirms that this year will see around 50 sales. Graham Wilkinson has been appointed Chassis Sales and Support Manager to promote the combined services. A competitive warranty package is offered on each of the chassis types. Standard warranty consists of 1st year comprehensive chassis and 2nd year driveline. For a cost, additional comprehensive warranties are available for the 2nd, 3rd and 4th year of operation up to 600,000km and driveline warranties for 3rd, 4th, 5th and 6th year of operation up to 600,000km although most body builders offer the standard chassis warranty. Mark Aspinall, Director, BASE Coach Sales commented, ‘BASE are delighted with the support we have received over the last two years from MAN. We have developed five new models with their assistance, three at Barbi and two at MOBIpeople and sales are outstripping our expectations. The support of the well-established MAN dealer network, particularly for our TGL based Midi Explorer product, is a vital part of the package.’ They exhibited at this year’s Coach and Bus Live, with three MAN products on display. Having spoken to several Neoplan Tourliner operators, the majority seem to want to stick with it. It is available in three sizes, the 12m P21 (49-seat fully executive or 53 seats with no toilet), the13.2m P20 53/55 seats and the 13.8m P22 61 seater. All models have the MAN D26 common rail 480hp Euro6, turbocharged, six-cylinder engine (with the exception of the 53 seat P21 which uses the Euro6 D2066 LOH 32 engine and the P21 49 seat which delivers 440bhp) and ZF AS Tronic, 12-speed TipMatic gearbox with ZF intarder and cruise control. Paul assured me that the Euro6 engines have had minimal teething problems and customers are claiming they are achieving 12mpg. Fuel tank size is 570-litres except for the P21 53 seat, no toilet variant, which has a smaller 400-litre capacity. Seating is supplied by Kiel in the form of the 1020 Avance reclining/slide-out seat fitted with gangway arm rests, fold out tables, magazine net and adjustable foot rests. Standard features across the Tourliner VIP range include Frenzel FOB 554 servery with 40 cup coffee machine, Alcoa Durabrite wheel rims, Bluetooth hands-free system with audio streaming, DVD player, Sat-Nav, reverse and forward facing cameras, dash mounted fridge, air conditioning and centre sunken fresh water toilet (with the exception of the 53 seat P21). A telematics system has been added to the package as standard and will monitor driver behaviour, which will in turn save on fuel consumption. Maintenance scheduling is another feature and additional options include live vehicle positioning and scheduling. An app is available to download for most media platforms to support the PC platform and offers a walk around check facility called MAN Fit to go. The two-axle P21 has a design GVW of 19,700kg , the P20 has a GVW of 24,900kg and the P22 a 25,530kg GVW. MAN is branding the Tourliner specification as VIP with the aim of providing all the ‘extras’ you might want fitted as standard. Paul commented, ‘There really is something for everyone in stock, our commitment is to quality and we are looking to increase the specification offer but we are also aware that we are having to compete with cheaper imports coming on to the market. We are in the process of developing an entry level model for those operators that are looking to reduce costs and may not require some of the VIP features and this will be available from 2016. Paul has projected that sales of the Tourliner should reach the 50 mark by the end of this year and he is currently recruiting additional Regional Retail Sales Executives to join Matthew Jacob, the Senior Retail Sales Executive. In house training is something that MAN are very proud of and they offer two day maintenance training courses for the Tourliner as part of the package. Field based staff will also offer training for their document management system and telematics package. Showing confidence in the build quality of their vehicles and to encourage operators to do likewise, an excellent warranty package is offered. All Tourliner VIP vehicles are inclusive of the MAN Warranty+ which includes three years, up to 300,000km comprehensive warranty followed by a further 12 month up to 400,000km driveline warranty. Four annual engine oil services which form part of their maintenance recommendations are included and cover engine oil changes, fuel and oil filters, valve check and adjustment as well as parts and labour and can be performed at any approved dealership. The warranty also allows access to the document database, a paperless system that can be accessed by both the vehicle owner and the service technician. All the documentation is uploaded and stored in one convenient place which will assist with VOSA OCR scoring. At the moment the document database is a storage facility only but MAN is looking at ways that the information stored can be used to provide performance reports and statistics. All vehicles must be maintained and serviced according to company specifications, using genuine MAN parts for the warranty to be valid and is accepted at all European MAN dealers. All mechanical and manufacturing faults and defects are covered as are any factory fitted components. Scheduled maintenance other than engine oil services, inspections, MOTs, tacho calibrations, glass, bulbs, fluid top ups and general wear and tear are not covered. The bus side of the business in the UK isn’t MAN’s strength, simply because it doesn’t have the right products that the market requires at present. As Paul explained, ‘we are a coach dealership with some bus.’ The CNG (Compressed Natural Gas) EcoCity was launched in 2012 to compete in the low emission urban bus market and is fully supported by the Gas Bus Alliance. Arriva were quick off the mark, placing an order for 21 for operation in the north of England while Anglian Bus also took some. Since then, take up has been relatively slow. However, Paul has said that the introduction of the latest Green Bus Fund has seen a surge in enquiries. EcoCity is competing against a number of hybrid and electric vehicles and with a GVW of almost 18 tonnes, it can’t compare with the lighter weight 10-12 tonne models that have dominated the market. Currently, gas bus sales in the UK average between 10-20 units per year although it remains popular throughout Europe with a current Portuguese order for 350 units. Used sales have not performed so well this year but there has been a massive improvement to the way that these vehicles are handled. At present, there are just nine used vehicles available in stock. This is all credit to the hard work that Paul and his team have put in to clearing the vast amount of vehicles that had been accumulated. Two years ago there were nearly 100. TopUsed is a head office initiative and is a new structure for the bus and truck division, having been introduced in March 2014. The format mirrors that which was introduced in Munich in that all their premium, own brand, used vehicles are located in one site. As the Manchester site is considered to be their ‘centre of excellence’, it seems only fitting that the vehicles should be housed there. Operators will travel some distance to look at a vehicle and delivery will usually take place from this site although they will take it to the customer if required. These are managed by Rael Winetroube, Top Used Sales Director who has been responsible for managing the used truck side of the business for a number of years, along with Andy Holliday, Trade Sales Manager and Matthew Neal, Retail Sales Manager. Once recruited, the South and Midlands sales representatives will join Matthew Jacob and between them will cover the entire UK for both new and used sales. MAN and Neoplan vehicles are taken as part exchange against new models and providing they are less than five years old and of a reasonable standard, they will go through their Top Used process. Vehicles from other manufacturers or those that don’t fit the qualifying criteria will be sold through their six approved used sales partners. Rael explained that it was important that a purchaser of a used MAN vehicle can expect the same quality and service level that they would get if buying a new vehicle. Each vehicle will undergo a rigorous pre delivery inspection and checks before handing over to the customer and if necessary, repairs to the vehicle will be done on site to ensure it meets the strict criteria. Any remaining warranty on the vehicle is honoured and finance and service packages are available on them if required. Rael is currently working on an extended warranty package, which he hopes to introduce next year. He is clearly passionate about this side of the business and the importance that the MAN brand and ethos is retained. He commented, ‘It is important that we look after our used customers by making sure that we sell them a first class product, we want repeat business, the same as for new. An operator can expect a consistently high standard product from us every time. New and used vehicle sales are symbiotic, they are completely interlinked and one can’t function without the other’ This is apparent in the sales training that is given, as although Andy and Matthew are used sales specialists, every sales person has to have an understanding of the entire product range, so that they can direct the operator to the best vehicle to suit their requirements. Rael assured me that time pressures are not a problem as having everything on site means that mechanically, the turnaround is quick. In addition, there are approved main dealers in the north and south of the country that can make cosmetic improvements if required. The website for TopUsed is being constantly improved and once you realise that there are different sections for bus, truck and coach, it’s fairly straightforward. Should you require finance for any vehicle, MAN Finance Services is a dedicated sector of the business, based in Swindon. They use their own funds and underwrite themselves so decisions are usually fairly quick. They offer a range of services including vehicle finance, hire purchase and finance lease. 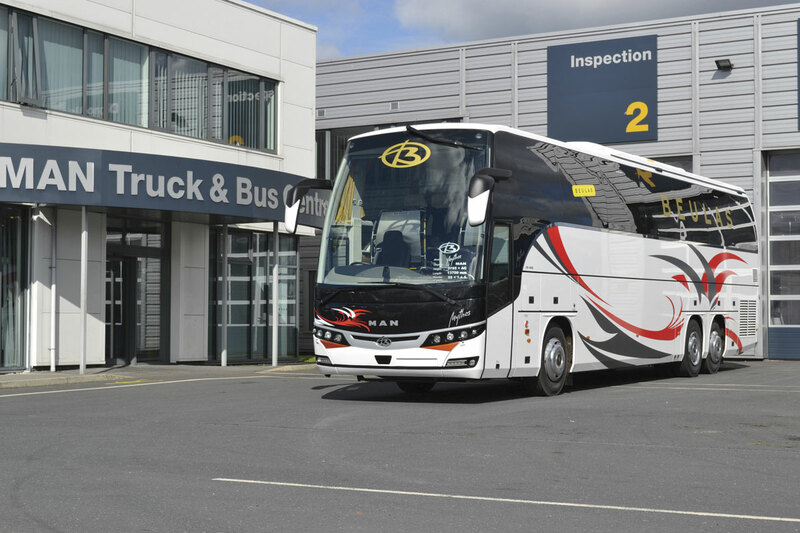 In September they introduced a contract hire agreement for the 13.2m 53/55 seat Neoplan Tourliner, which includes three year’s warranty, bronze service package and road tax for £3,550 + VAT over 36 months. They may look at introducing operating leases to the bus and coach sector. At the moment these are offered but aimed specifically at the truck market. The company can also offer insurance services and have partnered with C&C, an independent specialist motoring and transport insurer, based in the North West. Insurance is not just limited to the fleet; it can include premises as well employers’ and public liability. To protect the value of the vehicle, the company also offers GAP (Guaranteed Asset Protection) insurance. MAN’s after sales package is something that they are very proud of and have invested heavily in. They offer an After Sales Portal, which provides information on vehicle repair and maintenance and offers, all in one location. You need to register for the service and there is no charge. Registration is relatively simple, requiring a user name and password, details of the applicant, the company and their role within that business, the company registration details and confirmation that you agree to the terms and conditions. The portal is continuously expanded and improved but services already provided on the system include; report and maintenance manuals, diagnostics information, circuit diagrams, approved service products including fluids and lubricants, telematics, parts, service network contact details, technical support, workshop processes, seminars and training courses and technical support. MTBUK has a network of approximately 70 support locations throughout the UK. Every technician at each dealership has to take part in a five day training programme every year, as part of the MAN UTP (Up Time Principle) programme. This ensures that all approved dealers are up to date with the latest Euro6 technology. Mobile 24 is the company’s rapid roadside assistance service which is operated by the franchised dealer network and is available 24 hours a day, 365 days a year on a ‘pay as you use’ basis, using a free phone number. Their marketing material claims it is independently rated as ‘one of the best roadside emergency services in the UK and Europe.’ Their dedicated support vans carry parts specific to your vehicle and cover both MAN and Neoplan. Service levels implemented include a ‘scramble time’ of less than 15 minutes, with a technician getting to you within the hour. The technician will keep the control centre informed of an estimated ‘back on the road time’, which is relayed back to the operator’s base. The £49 call handling fee was scrapped in 2014. A range of service contracts are available for both new and used vehicles as an extension to Warranty+. The bronze package is included on all MAN new products as standard and covers all scheduled maintenance, including PMIs (preventative maintenance inspections) MOT and tacho calibrations. It also allows access to the document database. The silver package offers a Europe wide fifth year driveline warranty, with the main warranty covered worldwide. Gold covers all scheduled maintenance as well as wear and tear repairs and includes Mobile24 with recovery to the nearest approved dealer if required. Comfort Managed is their premium package. It offers the same benefits as the gold service but includes accident repair and glass damage. Detailed monthly cost reports and payment plans are available either as pay as you go or monthly budget schemes. Optional extras include O licence and compliance inspections. Comfort Managed has been shown to reduce maintenance bills by up to 30%, but this data has been fed back predominantly from the truck side of the business. All these after sales products and services which offer constant vehicle monitoring, form part of MAN’s UTP, their promise to ‘optimise the amount of time a vehicle can spend on the road, earning money.’ These all combine to meet with MAN’s standard 97% OCRS first time pass rate for MOTs. All this adds up to an impressive investment in resources. In the last year and a half, eight new members have joined the team, with more to come. One of Paul’s key focuses was to work with the Sales Administration team, based in Swindon. They have taken on a huge role, personally cleansing and updating their customer and prospects database and keeping them informed with a monthly e-shot as well as producing all the marketing material for the new bus and coach division and working with the sales team to provide administrative support. I asked Paul about new products and he explained that introducing the Cityliner, for example, to the UK market could impact on Tourliner sales as well as the partner vehicles they provide chassis for. The double deck Skyliner, which will be available next year. will be left hand drive only until it has proved itself in the market. He also intimated that the Nu-Track Pulse probably won’t offer a 12-tonne option unless on special commission as there is no current demand for increased capacity. Paul’s enthusiasm for his job and his commitment to the company is very apparent. He has worked incredibly hard during challenging times to produce a high quality offering, in sometimes very difficult circumstances. He modestly attributes a lot of what he has achieved to his team but does admit that the job nearly killed him in the first few months! I think it’s safe to say that MAN is back in the market.